Yes, I said breakfast salad. One of the things that has changed for me over the years since I’ve been Paleo, and even more so since adopting the Paleo Autoimmune Protocol, is breakfast. I really don’t think of “breakfast foods” any more. Like so many people, I used to rely on cereals and toast first thing in the morning and couldn’t wrap my head around eating anything else, even when I got rid of grains. It was hard at first to get used to the idea of having to cook eggs or eat something that I didn’t consider a “morning” food. These days, though, breakfast is just another meal. That’s why you don’t see me making “Paleo” pancakes, muffins or waffles around here or on my Instagram feed. I don’t want to make special food that takes expensive ingredients, single use equipment or a PhD in baking materials. That’s just not my jam. I’d rather roll out of bed, have a mug of something hot and put together a quick something that’s got some protein, plenty of vegetables, some good fats and some starchier vegetables if I’m hungrier than usual. If that meal happens to be based on leftovers, even better. So breakfast this morning, as an example, was leftover broccoli soup that I added extra broth to before reheating, then finished with some ground beef and extra handfuls of mixed greens just before serving. Simple, delicious and nutrient dense. That’s how I roll! So, anyway, back to breakfast salad. The first thing on my plate or in my bowl in the mornings is always some kind of vegetable. When it’s colder, that’s usually in soup form, but a salad is a great blank canvas to start with. Don’t go thinking about lettuce, though! My go-to breakfast salad base, bought in big ol’ bags from Sam’s or Costco, is always a mix of hearty greens. My current favorite is a blend of baby spinach, chard and kale – maximum greenage, minimum effort to store and prepare. This breakfast salad recipe takes that vitamin-fest of a base and tops it with still-warm garlic baked sweet potatoes and bacon, making a satisfying start to the day. 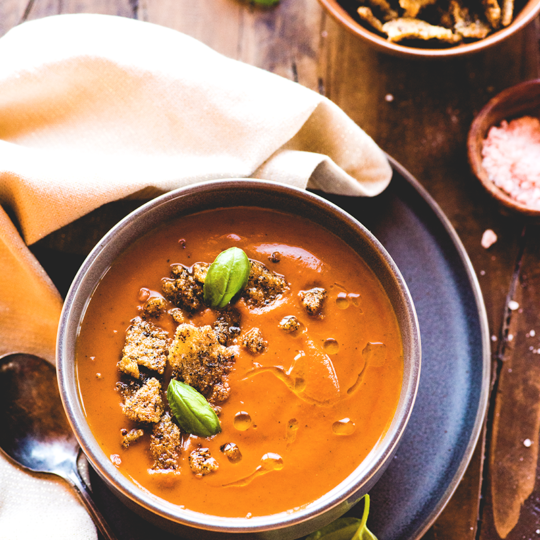 Think of this recipe as a base and adapt it to suit your taste. Or, if you’re me, whatever you have in your fridge. I usually make this breakfast salad at the weekend (maybe I should have called it a brunch salad!) because of the time needed to bake the sweet potatoes, but I’ve found a good way to save time by prepping them ahead. If you bake the sweet potatoes up to a few days in advance, you can store them in the refrigerator until you need them, then cook them up in the rendered bacon fat on the day. The sweet potatoes turn out even better that way, crisping up at the edges and turning a beautiful golden brown. Whichever way you make your sweet potatoes, this breakfast salad will be a hit. It’s even better if you drizzle the salad greens with a flavored olive oil. My favorite with this breakfast salad is a tie between a herbacious basil infused olive oil or a more punchy garlic infused olive oil. This recipe is both Paleo Autoimmune Protocol and Whole30 compliant! Make sure to use sugar free bacon if you’re doing the Whole30. 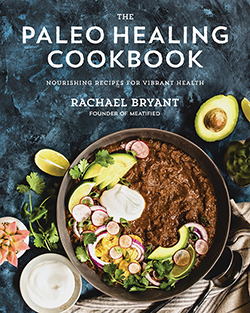 PS – for those of you staying tuned for the release of Nourish: The Paleo Healing Cookbook, some news! I’ll soon be announcing FREE bonus content for those of you who pre-order – so if you have already been kind and generous enough to support me by pre-ordering the cookbook, keep hold of your receipts! Don’t forget, you can see all the details for Nourish and photos from the book here. Know what I’m also SUPER excited about? Nourish now has a foreword, written by Sarah Ballantyne (aka The Paleo Mom and Paleo Autoimmune Protocol superstar) New York Times Bestseller and author of both The Paleo Approach and The Paleo Approach Cookbook! Somebody pinch me. BAKE: Preheat the oven to 400F / 205 C. Peel the white sweet potatoes and chop into bite size cubes. In a bowl, toss the potatoes together with the avocado oil and garlic powder until evenly coated. Line a baking sheet with foil or parchment paper, then spread out the sweet potato in a single layer. Sprinkle generously with salt and bake for 20 minutes, until the sweet potato is tender in the middle and beginning to turn golden at the edges. Remove from the oven and set aside to cool slightly. FRY: While the potatoes are baking, cook the bacon until crisp. Allow the cooked bacon to cool enough to handle, then chop into small pieces. Reserve for later. ASSEMBLE: Divide the greens between four plates, then top with the onion and olives. Drizzle the salads with olive oil, to taste, then add the warm sweet potatoes. Finish each plate with a generous sprinkling of bacon bits and serve immediately with the sliced avocado on the side! love breakfast salad! when people see it they get a little freaked out. I love fried egg sweet potato on a bed of mixed greens and whatever other vegies are handy. I’m holding out for the day when (hopefully) I can enjoy a breakfast salad topped with a poached egg with runny yolk! Yuuuuum! Pingback: 21 Most Delicious Ways to Enjoy Healthy Greens – Brian C. Dates __Resistered vascular technologist.